Kitchens Glasgow are your local recommended kitchen design and installation specialists. Our kitchen designers and kitchen fitters have been designing and installing fully fitted kitchens for over 15 years. Throughout this time we have completed hundreds of high quality fitted kitchens in Hillington, Clydebank, East Kilbride, Paisley, Glasgow and the surrounding areas. Therefore, when it comes to kitchen design and installation, it is our speciality. Kitchens Glasgow provide free, no obligation kitchen design and quotation services in the comfort of your own home. Unlike many other local kitchen fitters, Kitchens Glasgow provide a complete service from start to finish. This includes kitchen planning, design, structural alterations, and all building work. For your peace of mind all our fully fitted kitchens, components, and appliances come with a comprehensive 5 year warranty. We are also fully insured, and all workmanship is guaranteed. All our tradesmen are highly experienced and fully qualified, our team consists of the following: Kitchen Fitters, Plumbers, Electricians, Gas Safe Engineers, Tilers and Flooring Fitters. This ensures all our customers receive fully fitted kitchens of the highest quality. Choosing a style of kitchen is easy, we have an extensive range of kitchens available to choose from in our kitchen showroom. These include bespoke, classic, contemporary, modern, traditional, and German fitted kitchens. We also have a superb range of kitchen worktops, kitchen appliances, wall coverings, and floor coverings in our showroom. 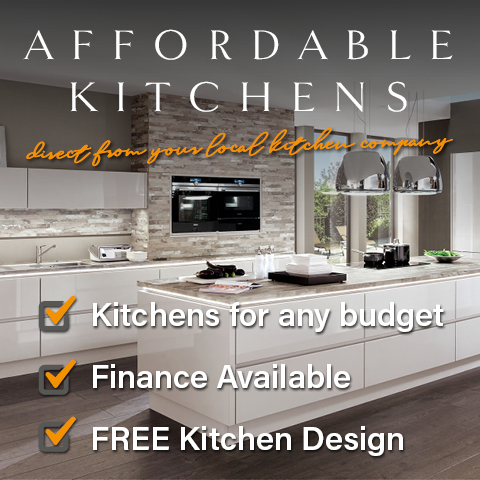 To arrange a consultation with one of our kitchen design and installation specialists or if you would like to arrange a free home design visit contact Kitchens Glasgow today on 01357 238491. Kitchens Glasgow installed our new kitchen, we found them to be reliable, honest, clean and tidy. They ripped out the old fitted kitchen and installed our new one in 5 days. I would recommend these kitchen fitters. First class recommended company! Astounding knowledge of all things kitchens and how to make it fit! They managed to take my ideas and make it work even in such a small place. Excellent contact and very informative. Great level of service and included a free kitchen design and planning service. I choose this company to expand my kitchen after meeting Alistair the kitchen designer and feeling quite comfortable, great service. I used Kitchens Glasgow to renovate my old tired kitchen. After receiving several quotes I found that they were more affordable and could offer me a better quality kitchen. Affordable and recommended service. Our new kitchen looks fantastic, we couldn’t be happier. Hard working kitchen fitters, large kitchen showroom with friendly staff, clean and tidy job. Ian and the team were excellent, highly recommended! Thank you! We were looking for a kitchen company with a good reputation who offered a payment plan. We decided to go with the buy now pay later as it suited us better. We received a great service and the boys are very helpful. Kitchens supplied and fitted in Alexandria, Barrhead, Bearsden, Bothwell, Cambuslang, Clarkston, Clydebank, Cumbernauld, Greenock, Johnstone, East Kilbride, Hillington, Helensburgh, Kilsyth, Kirkintilloch, Milngavie, Newton Mearns, Paisley, Renfrew, Rutherglen, and Thorntonhall 01357 238491.